Along with a bunch of lovely food blogger folk, I'm taking part in a challenge to cook an apple-inspired dish (you can check out all their amazing concoctions by searching the hashtag #aisforalltheapples). It's finally feeling like summer in Perth, and I really wanted to do something light and fresh and crunchy. Enter my cabbage, jerusalem artichoke, walnut and - most importantly - apple Waldorf Salad. The traditional Waldorf salad apparently dates back to the late 1800s and at first was composed only of apples, celery and mayonnaise. By the 1930s they'd started zhushing it up and walnuts had become a standard addition. I think it's time for another ingredient to join the prestigious ranks: salty, crispy, shallow-fried Jerusalem artichoke! I've made mine a little lighter than the classic version by using a buttermilk, mayonnaise and lemon juice dressing, with sumac for added zing. Something about the purple and white cabbage makes me think of funky witches wearing colourful cloaks and playing jazz saxophone... hence the title of this post (..it's late, I'm sleepy, I don't know). The cabbage also gives it an extra crispiness that goes nicely with the apples, and the fried Jerusalem artichokes are crunchy, salty, and delicious! It works great the next day as a coleslaw with hot chips, vinegar and a nice bottle of white wine too. I know that because I take my recipe testing very seriously, always endeavouring to see which of my inventions pair well with hot chips and wine. Turns out most do. 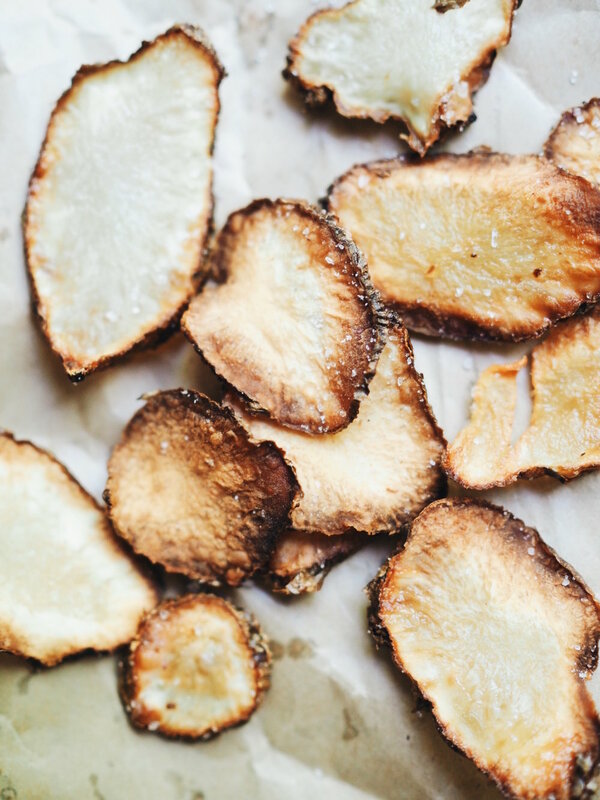 Slice the jerusalem artichoke into very fine slivers. Pour the olive oil and vegetable oil into a small saucepan, and put on moderate heat. One the oil is hot, add your slivers of jerusalem artichoke. Let them fry until they have gone golden brown. Remove with a slotted spoon, place on a kitchen towel and salt generously. Roughly chop the walnuts. Spread them onto a baking tray and roast in the oven at 200˚C for about 5 minutes, or until they have started to brown. 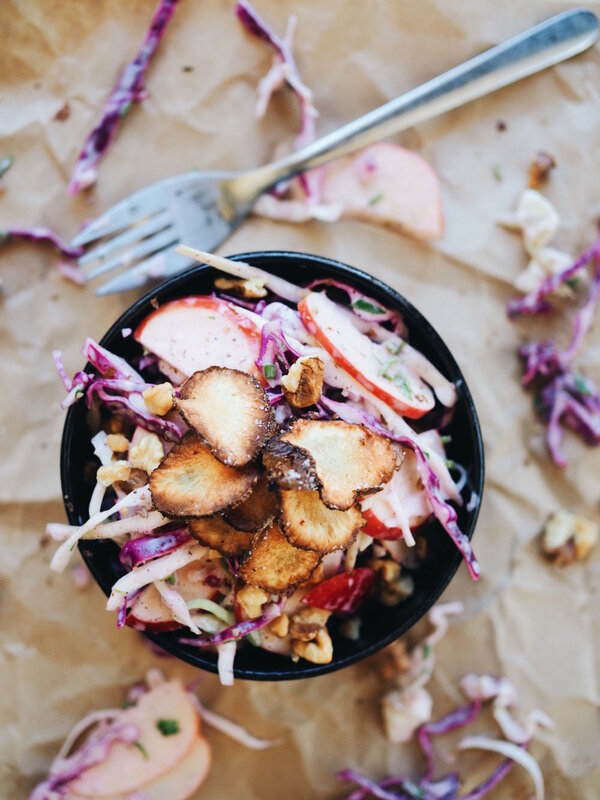 Place the shredded cabbage, red onion, walnuts and apples in a large bowl. In a small bowl, whisk together your mayonnaise, buttermilk, garlic, lemon juice and sumac. Pour this dressing over the cabbage, onion, celery, walnuts and apples and toss to combine. Season with a little salt and pepper to taste, then divide into serving bowls and top with a few of your jerusalem crisps.